Quick Update: I got featured in Pro Video Coalition again! This time it was my Media Composer tip on creating a new track at a specific track number. Check it out here! I have some other updates and notes at the end of the post so keep reading if you want see them! Last week I mentioned I wanted to get into some more technical, how-to posts. That’s what we’re going to do here today. 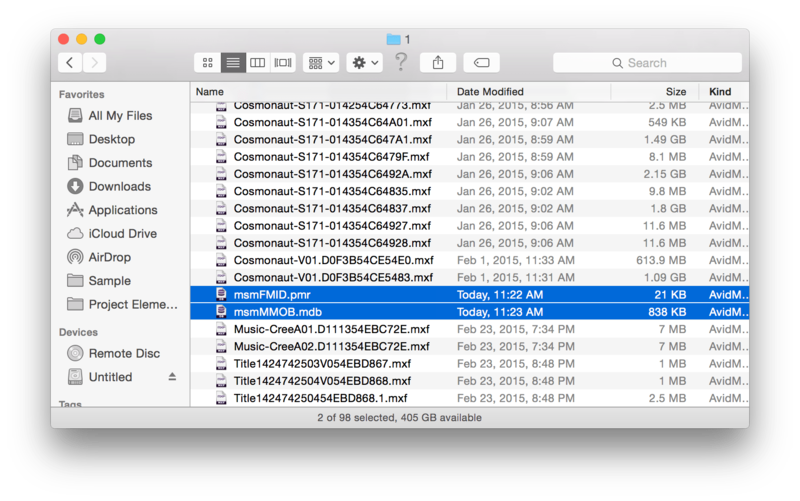 This post is on how and why you would need to delete your Avid Media Composer database files in order to re-index your media. This post is pretty much just for Media Composer editors. However even if you’re not editing with my personal favorite NLE you can still stick around for the ride or you can skip to the end to see my other quick updates and notes. 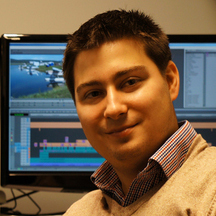 What are Media Composer databases? 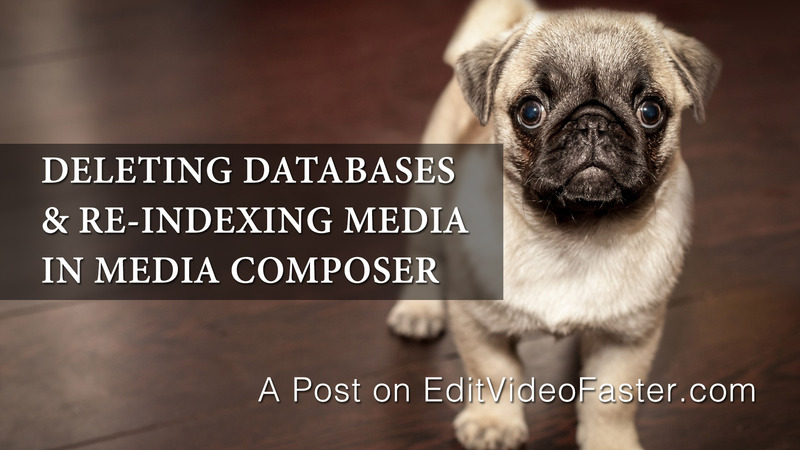 Media Composer indexes media into databases so that it can quickly look in an Avid MediaFiles folder to connect the MXF files to the master clips inside your project. Note: I have no idea how Avid defines any of this but this is how I interpret how everything works. Sometimes things get messed up in the little 1’s and 0’s and the MXF files can’t be read by Media Composer. To fix this the database files need to be deleted and recreated. I’ll show you when you might need to do this and how. How do I delete databases and rebuild them? If it worked, give me a shout out on Twitter or send me a private message. If it didn’t work, hit the Avid forums. If you have the right media folder on the correct file path for the project with media offline, your media should reconnect after re-indexing. Re-indexing can take some time too (this is in regards to Step 6 from above). It can take upwards of 30 minutes or more depending on how much media there is and how fast your system is. This method has fixed about 85% of my offline media problems over the years. It won’t fix everything, but it’s always the first thing I do when my media is offline. Okay, that’s it for the instructional part. Now I just have a couple personal comments. First, I’d love to know who is reading this. Head on over to my contact page, put Hi Josh! in the subject line and let me know a little about you like who you are, where you’re from, what kind of projects you like to edit, what you’re struggling with, … anything. I’m here to help you as an editor in any way that I can. Second, if you found this post helpful and want to get an email when I come out with a new one (typically once a week and a new tutorial once a week), punch in your email address in the box at the top right of this page where it says, “Subscribe to Blog via Email.” I’ll never spam you or anything like that. You’ll simply get an email you can easily unsubscribe from when I come out with a new post. Third, I’m cranking away at this secret project I’m working on. I’m hoping to have a large portion finished by the end of this weekend and if that’s the case I’ll announce what it is next Wednesday! Any encouragement is greatly appreciated. You also might want to buy stock in Starbucks as I’m downing iced vanilla coffees trying to get this done. Lastly, thank you so so much for reading. I look forward to hearing from you and I’ll see you on Friday with a new tutorial! Hi Rawb! Yes, this DOES work on shared storage systems like the one you mentioned. However you will have to drag the MXF files from the other folders into whatever folder your computer is named (to force Media Composer to re-index all the MXF files and not just the ones in your computer’s folder). If someone at your work told you specifically not to though, you may want to respect their wishes and ask them why. However this does work. If you need more assistance feel free to shoot me an email — josh [at] editvideofaster.com or message me through the contact page in the menu bar.